Chris will be doing things he shouldn’t be able to do, performing tricks nobody has ever seen or done before, controlling coincidence, probing theories of fate and answering the FAQ: ‘Can you use this stuff to attract girls?’. Determined to deliver the most satisfying hour possible Chris will be handing control over to his audience by giving them the power to control his actions with their minds. Cox manages to mix a love based narrative with some of the most unique and incredible mind-reading effects ever seen on the stage. 15/07/12 - 1:00pm Fatal Distraction Latitude Festival Southwold, Suffolk Performing in The Comedy Arena on Sunday 15th as part of Latitude. 28/08/11 - 7:10pm Fatal Distraction Pleasance Dome Edinburgh The all new show for the 2011 Edinburgh Fringe Festival. 27/08/11 - 7:10pm Fatal Distraction Pleasance Dome Edinburgh The all new show for the 2011 Edinburgh Fringe Festival. 26/08/11 - 7:10pm Fatal Distraction Pleasance Dome Edinburgh The all new show for the 2011 Edinburgh Fringe Festival. 25/08/11 - 7:10pm Fatal Distraction Pleasance Dome Edinburgh The all new show for the 2011 Edinburgh Fringe Festival. 24/08/11 - 7:10pm Fatal Distraction Pleasance Dome Edinburgh The all new show for the 2011 Edinburgh Fringe Festival. 23/08/11 - 7:10pm Fatal Distraction Pleasance Dome Edinburgh The all new show for the 2011 Edinburgh Fringe Festival. 22/08/11 - 7:10pm Fatal Distraction Pleasance Dome Edinburgh The all new show for the 2011 Edinburgh Fringe Festival. 21/08/11 - 7:10pm Fatal Distraction Pleasance Dome Edinburgh The all new show for the 2011 Edinburgh Fringe Festival. 20/08/11 - 7:10pm Fatal Distraction Pleasance Dome Edinburgh The all new show for the 2011 Edinburgh Fringe Festival. 19/08/11 - 7:10pm Fatal Distraction Pleasance Dome Edinburgh The all new show for the 2011 Edinburgh Fringe Festival. 18/08/11 - 7:10pm Fatal Distraction Pleasance Dome Edinburgh The all new show for the 2011 Edinburgh Fringe Festival. 17/08/11 - 7:10pm Fatal Distraction Pleasance Dome Edinburgh The all new show for the 2011 Edinburgh Fringe Festival. 16/08/11 - 7:10pm Fatal Distraction Pleasance Dome Edinburgh The all new show for the 2011 Edinburgh Fringe Festival. 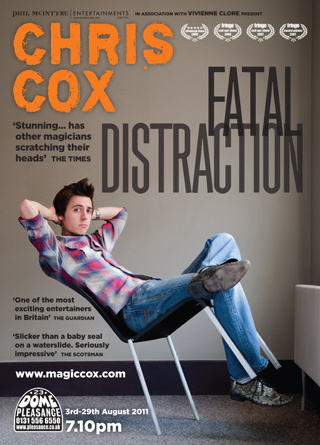 15/08/11 - 7:10pm Fatal Distraction Pleasance Dome Edinburgh The all new show for the 2011 Edinburgh Fringe Festival. 14/08/11 - 7:10pm Fatal Distraction Pleasance Dome Edinburgh The all new show for the 2011 Edinburgh Fringe Festival. 13/08/11 - 7:10pm Fatal Distraction Pleasance Dome Edinburgh The all new show for the 2011 Edinburgh Fringe Festival. 12/08/11 - 7:10pm Fatal Distraction Pleasance Dome Edinburgh The all new show for the 2011 Edinburgh Fringe Festival. 11/08/11 - 7:10pm Fatal Distraction Pleasance Dome Edinburgh The all new show for the 2011 Edinburgh Fringe Festival. 10/08/11 - 7:10pm Fatal Distraction Pleasance Dome Edinburgh The all new show for the 2011 Edinburgh Fringe Festival. 09/08/11 - 7:10pm Fatal Distraction Pleasance Dome Edinburgh The all new show for the 2011 Edinburgh Fringe Festival. 08/08/11 - 7:10pm Fatal Distraction Pleasance Dome Edinburgh The all new show for the 2011 Edinburgh Fringe Festival. 07/08/11 - 7:10pm Fatal Distraction Pleasance Dome Edinburgh The all new show for the 2011 Edinburgh Fringe Festival. 06/08/11 - 7:10pm Fatal Distraction Pleasance Dome Edinburgh The all new show for the 2011 Edinburgh Fringe Festival. 05/08/11 - 7:10pm Fatal Distraction Pleasance Dome Edinburgh The all new show for the 2011 Edinburgh Fringe Festival. 04/08/11 - 7:10pm Fatal Distraction Pleasance Dome Edinburgh The all new show for the 2011 Edinburgh Fringe Festival. 03/08/11 - 7:10pm Fatal Distraction Pleasance Dome Edinburgh The all new show for the 2011 Edinburgh Fringe Festival. 10/07/11 - 8:00pm Fatal Distraction Pleasance Islington London Preview for Chris’ new show. Come see it for cheap while it could still be a bit rubbish. 03/07/11 - 7:00pm Fatal Distraction Canal Cafe Theatre London Preview of Chris’ new show Fatal Distraction. 26/06/11 - 8:00pm Fatal Distraction Pleasance Islington London Preview of Chris’ new show Fatal Distraction. Come see it for cheap while it could be a bit dodgy still.